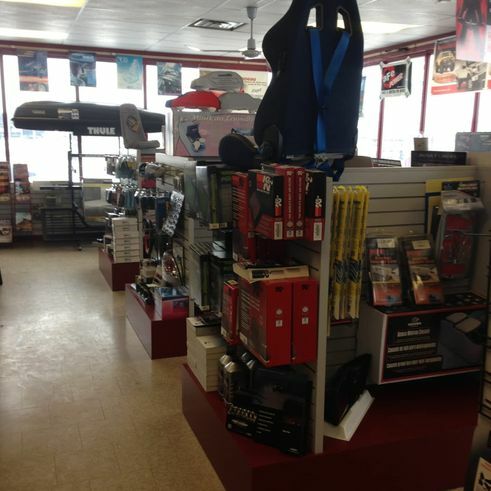 Our mission at Everything Automotive by Houghton is for you to be completely satisfied with any and all of your auto accessories. This means that we go to every length to make sure our accessories are acceptable, whether you’re searching for automotive rust-proofing solutions or basic car protection items. After all, our reputation as trusted vehicle experts depends upon us meeting our own personal standards, as well as your own. Set up an appointment by calling or e-mailing us today and find out for yourself what we mean when we say “you are not just a customer, you are our priority”. Bed Caps & Bed Rails – Protects the bed of your truck from scratches and nicks while enhancing the appearance of the truck. Bed caps come in ABS, stainless steel or aluminum diamond plate, while Bed Rails are chrome and come in a variety of sizes with tie-down options. Spray-In Bed Liner – Protective liner gives your bed the protection that will look great years from now. Fender Flares – From an OE style to the bold look of the Pocket style flare give your truck that tough look and protection from road debris. Bull Bars & Grille Guards – Want that tough look while protecting the front end? Be a presence in the bush or in the burbs! 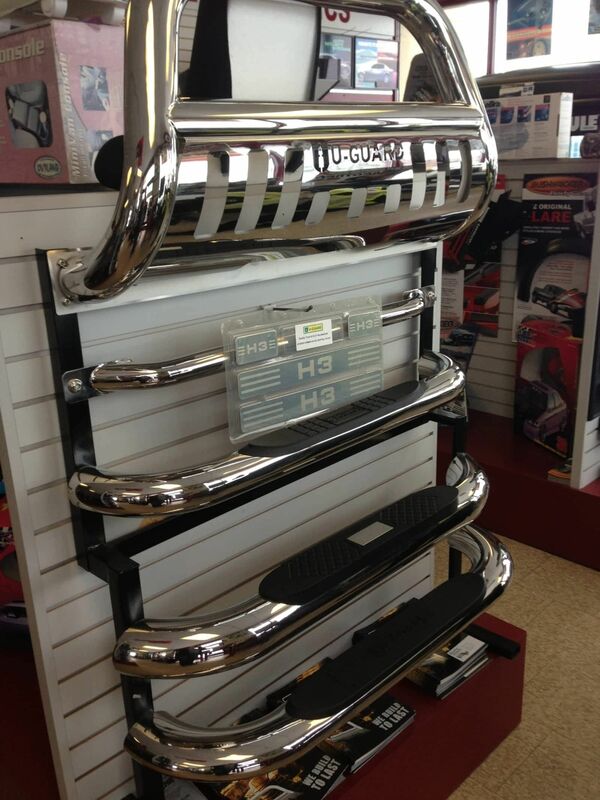 Style your ride with a grille guard or bull bar available at Houghton’s. Mud Flaps – Custom fit mud flaps protect your vehicle from rock and debris coming from the wheels as you drive. From hard moulded flaps to hitch mounted heavy duty flaps, Houghton has them all. Chrome Accents – Enhance the look of your factory door handles, mirrors, taillights, rocker panels, fender trim and more! Cargo Management – Want to go on vacation and need extra packing space – no problem. Check out Yakima or Thule Roof Top Boxes. Contractors – you need an easier way to work out of your truck’s bed, sure – we have that bed slide to make your life easier! Check out Decked for trucks and now introducing Decked for Vans! Tool Boxes to store your tools, cables and such. From the simple cargo to heavy duty, we can get what you need. You never get a second chance to make a first impression. That's why it's so important to get everything right the first time. When you're talking about the first impression of your car, what's the first thing people see and base their opinion on? The grille! The grille of a car can tell you a lot about the driver and the vehicle itself. Show off your personal taste with a New Grille. There's never been a better time to buy a grille than now. Houghton offers Grilles from the best brands like Paramount, T-Rex, and RBP. Each company uses modern technology and precision tools to manufacturer unique grilles with perfect fitment only matched by OEM products. Geared toward lifted trucks with aggressive looks or lowered cars with classy style, the Grilles offered are sure to fit your taste. For the street cruisers, many other styles are available with classic billet construction and fine wire mesh made of stainless steel that is polished to a mirror finish. Black powder coated grilles are also available to provide your car with the popular "blacked out" look. Installation can range from a simple overlay to a complete factory grille removal so if you have any questions take a look at our suppliers or call us for a guaranteed fitment. 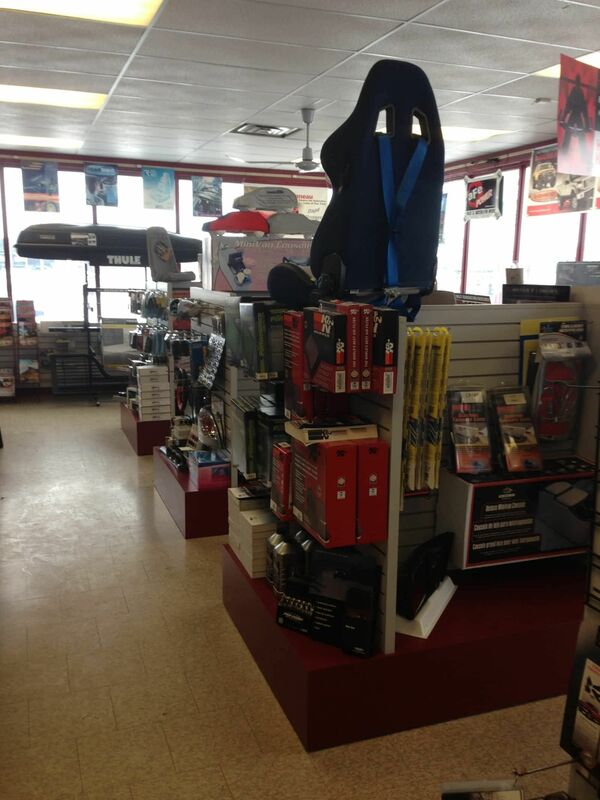 Lighting – From light bars, gog lights, flood lights, Houghton’s can get whatever you need to brighten your ride! Light Bars are a must for those of you who take your vehicles off-road or are just want to add some more style to your vehicle. 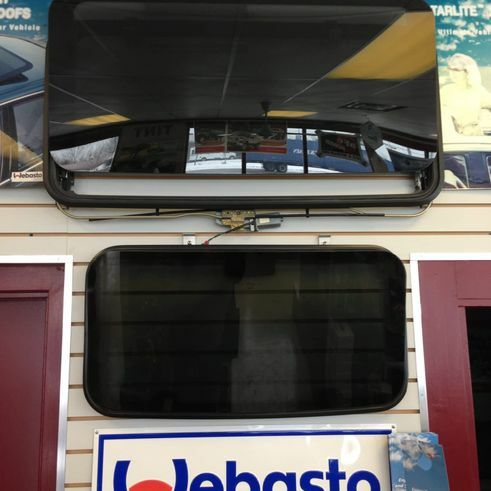 They offer great protection for the front end of your vehicle as well as your off-road lights. We can get you what you need. Want to style your ride with new headlights, taillights, or covers – we do it. Need LED or higher performance bulbs – no problem! HID/LED conversion kits – come see what we have. No job is too small for Houghton’s! Heavy Duty Bumpers – An aftermarket replacement Bumper offers maximum front end protection for your ride while adding an aggressive off-road look. Most of the aftermarket replacement front bumpers include more than just the bumper portion. In fact, most also have Grille Guards or Bull Bars & Winches incorporated into the bumper itself for full front end protection. You can also add LED fog lights or light bars. The rear replacement bumpers are built just as rugged and deliver protection on the other end of your ride. 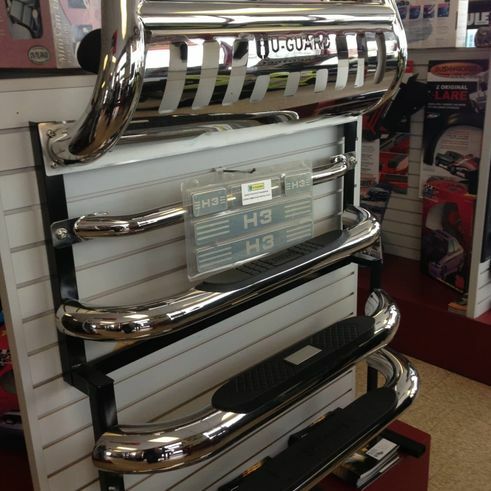 Running Boards & Nerf Bars – Whether it’s tubes or boards for your SUV, Van or truck, Houghton has a large selection. 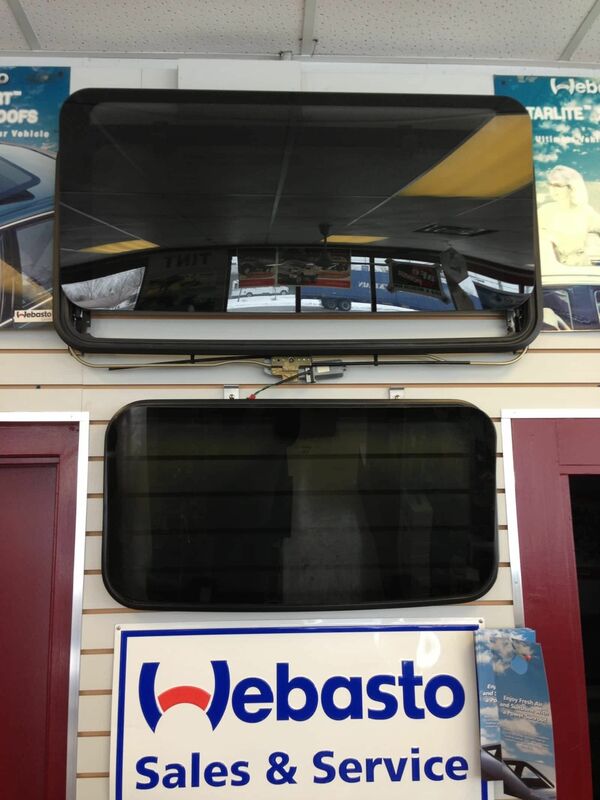 Call us for outfitting your vehicle. 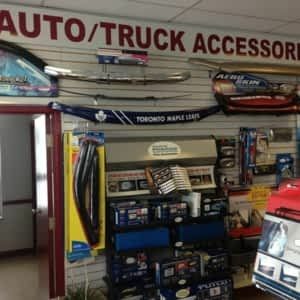 Truck Bed Accessories – we can provide a countless supply of truck bed accessories from protection to functionality. BedStep by Amp Research, DeeZee Tailgate Assist, Extang Tailgate Seal, Anchor Bolts, Westin Tailgate ladders, Lund ramps, Go Rhino hitch steps, Custom Flow, Trail Fx or Go Industries air flow tailgates, Covercraft tailgate nets. The list is endless. Truck Caps & Lids – Ranch truck caps provide an array of high-quality fibreglass canopies painted to match your truck. There are a variety of optional features to suit your needs and lifestyle as well. Ranch also carries aluminum contractor grade caps built to your personal specifications. Check them out. Hitch & Hitch Accessories – Whether you are towing a small trailer to heavy duty towing, we do it all here! From a class I to the 5th wheel or Gooseneck trailer hitch. We are your one-stop shop for your standard electrical connectors, electric brakes, 7-pin adapters to inverters. We will get you hitched up today! Call us for fitment. Jeep Products – Whether your Jeep is for puttering around the city or going all out off-road, we can provide you with the top Jeep aftermarket products. Accessorize your Jeep’s interior or exterior. We’ve got you covered with access to; soft & hard tops, fender flares, winches, lift kits wheels & tires, doors, step bars, tire carriers, lighting, mud flaps, floor liners and much more. Truck Racks – Built not only for professionals, these racks have the functionality that you need to carry and protect your valuable gear. From ladders, lumber, piping to Kyaks and canoes, these racks are able to safely secure your gear for travel. Why Get a Tonneau Cover? Tonneau covers offer a level of protection that's unmatched. No prying eyes checking out the junk in your trunk! Additional accessories like tailgate locks can protect from burglary as well. Tonneau covers may also improve aerodynamics and cut down on your pickup's fuel consumption on the highway. Whether you're looking at a soft tonneau cover with roll up, folding features, or a hard truck lid that converts your truck bed into a big trunk, today's truck bed covers are custom fit, clean, stylish, and can even be paint colour matched to your ride. 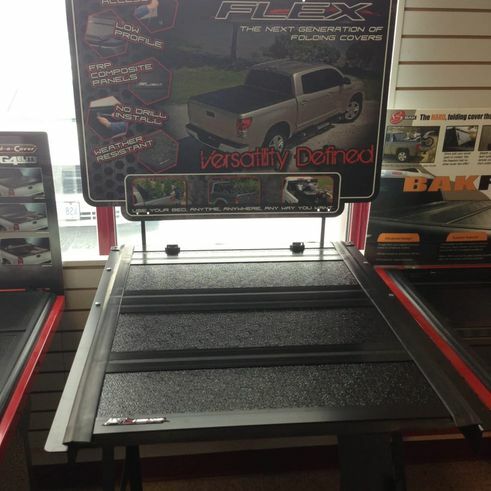 Get the perfect tonneau cover for your truck. Pickup truck covers are so versatile these days that not only is installation just a matter of minutes, covers can be easily removed, folded or rolled back to any length to make room for larger loads. Want to add a rack to your truck bed? Bed rails? Back rack? How about a truck bed toolbox? No problem! Today’s covers are designed specifically to work with hundreds of truck bed accessories from all types of manufacturers. Every cover we offer is right for somebody! Once you figure out your budget, choosing a cover is easy. At any point during the process, connect with one of our tonneau experts to find the right cover. Take a look at the different types of covers broken down. A hinged tonneau cover is usually one solid piece that is connected to a hinge near the cab of the truck. The material is usually fibreglass or ABS which offer the best in security because of the durable construction and built-in locks. This unique style of cover offers the same amount of security as hinged and is usually made of aluminum. These covers roll neatly into a canister in the front of the bed, with the help of a spring loaded rail. Very innovative design and low profile make these great covers. This is the most popular style of soft tonneau cover. Soft covers don't provide as much security as the hardcovers, but they make for an affordable, good-looking addition to any truck. They feature creative ways to keep tension and a coveted low profile look on your truck. These are the most affordable covers because of the limited tech involved, but with newer snap covers comes more features and ease of operation. Just like it sounds, these are soft covers (either roll-up or snap) that accommodate for most standard sized toolboxes. Previously, you would have had to decide between a tonneau cover or a toolbox, this type of cover allows you to have the benefits of both. 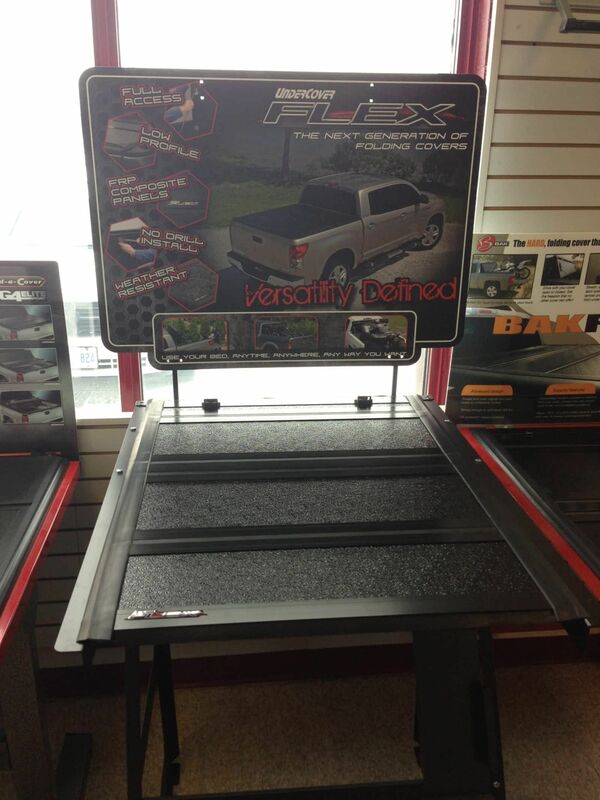 There are also hard folding tonneau covers which provide a toolbox option. Check it out! Hard folding covers, like retractable covers, take the hardcover in a different direction. Metal panels are connected with hinges that fold up to the cab of the bed. Ultimate security and function make these some of the most practical covers available. A soft folding tonneau cover would be the alternative to a roll-up or snap. These covers are usually constructed of an aluminum frame that folds into 3 sections. Since they have vinyl or canvas tarps, they are very light and easy to use. Dirty shoes and the carpet inside your luxury vehicle don't go together very well. Stained floor mats aren't attractive to anyone, and everyone knows if you have stains everywhere, it affects the rest of the appearance of your vehicle. Fortunately, Houghton offers many different styles of floor mats and floor liners. Each will provide your carpet with maximum safety while also adding a new stylish look to the vehicle. No matter what type of floor mat you're searching for, we have it. Seat Covers – Seat covers offer maximum protection for your seats and if they have any damage, these covers will make them look like new. Seat Covers are the perfect upgrade if you're looking to get rid of your stains and tears, or if you simply want to upgrade the look of your cloth interior. Interior Storage – Whether you are a contractor, a sportsman or simply someone who would like to keep the things in the back seat organized, our under seat storage units are perfect for you. Keep your tools, bungee cords, rain gear, fishing tackle, first aid kits, jumper cables neatly organized and safe from sliding around with one of these under seat storage units. If we did not mention what you are looking for, contact us, we can source it out for you! After all, we ARE Everything Automotive by Houghton!